The new Ambassador of Belgium to the Maldives, His Excellency Franҫois Delhave, presented his credentials to His Excellency, President Ibrahim Mohamed Solih, this morning at the President’s Office. After a brief ceremony the President and the Ambassador discussed ways to further consolidate friendly ties between our two countries. 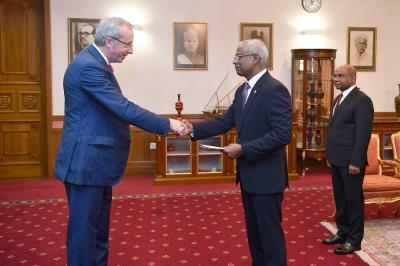 President Solih expressed his desire that Belgium and the Maldives increase our international cooperation, reiterating his administration’s commitment to progress on the issues of human rights, climate change and good governance, and welcomed the prospect of cooperation with Belgium on these important spheres. Further, The President highlighted that the EU policy dialogue will be held later this month, and that the Maldives’ will host the partnership forum in June. He conveyed his hopes that these dialogues will pave the way for constructive engagements between Belgium and the Maldives, and facilitate investment and economic cooperation between our two countries. The Ambassador reciprocated the President’s positive sentiments and expressed his desire to build on existing positive relations during his ambassadorial tenure.